This tunic was worked in 2013. 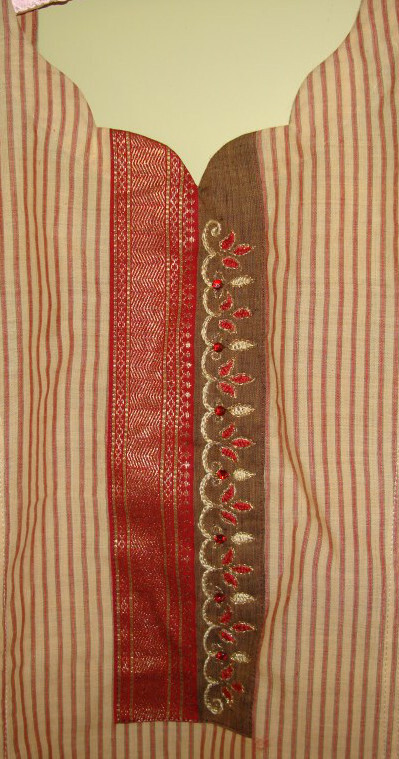 The fabric is mangalagiri cotton. We call this colour as sandalwood colour. This fabric was fairly thin for it to be used for chikan work embroidery. Though generally, the chikan work embroidery being shadow work, the closed herringbone stitches are worked on the wrong side of the fabric. There are many exceptions to this. I wanted to work closed herringbone stitches on both sides of the fabric. The yoke and the sleeve embroidery patterns were traced on to the fabric. Starting with darkest colour, the closed herringbone stitches were worked. The next colour was also worked in the same manner. 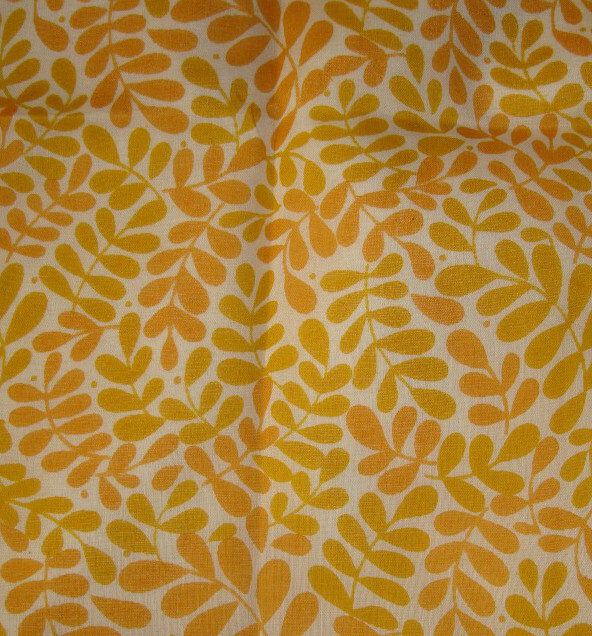 The third colour which was very light compared to the other two was worked on the right side of the fabric. This time it was fish bone stitch. Cream colour thread was used for outlines and french knots. The sleeves were worked in the same manner. The detail of the tunic. Early 2013, my computer had some problem, and I lost most of the images of the details of the embroidery projects worked after june 2012. This kept me discouraged for quite some time. So there is a backlog of project details from 2013. I am hoping to post these whenever time permits. The Mattrah souq in Muscat is filled with oxidized silver jewellery. 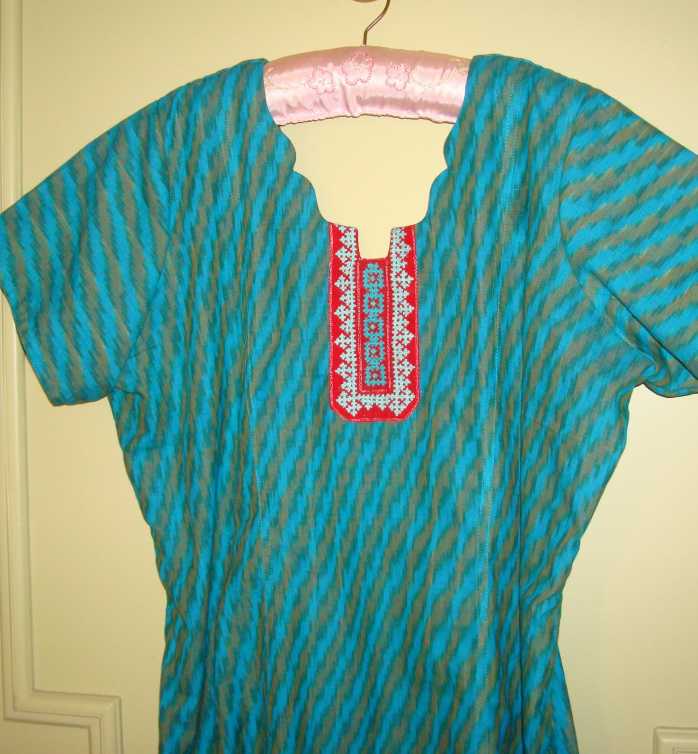 The inspiration for this tunic is from a turquoise and coral ear piece. 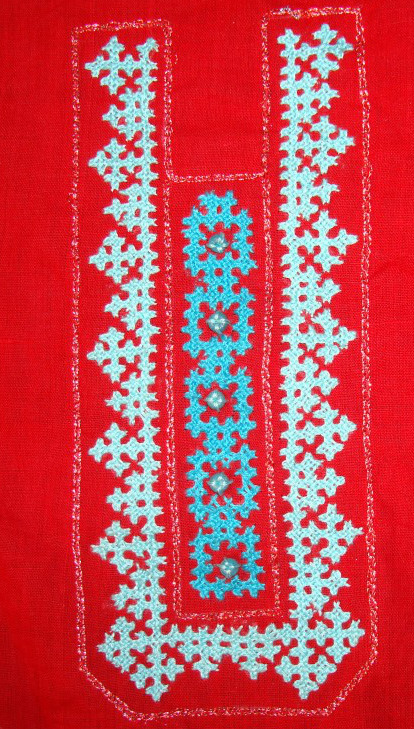 When a blue cotton fabric was found for the tunic, the idea of working the embroidery in red fabric rose simultaneously. 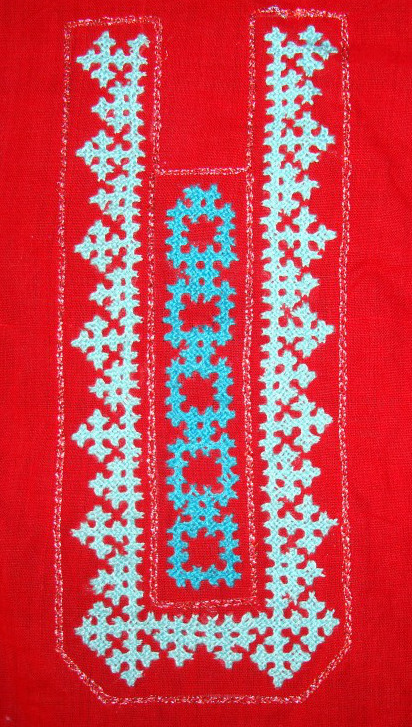 Indian ethnic kutchwork design was chosen for this project, the kutchwork embroidery in blue on red fabric. The border in the centre was worked in medium blue. The outline stitch to work the interlacing. 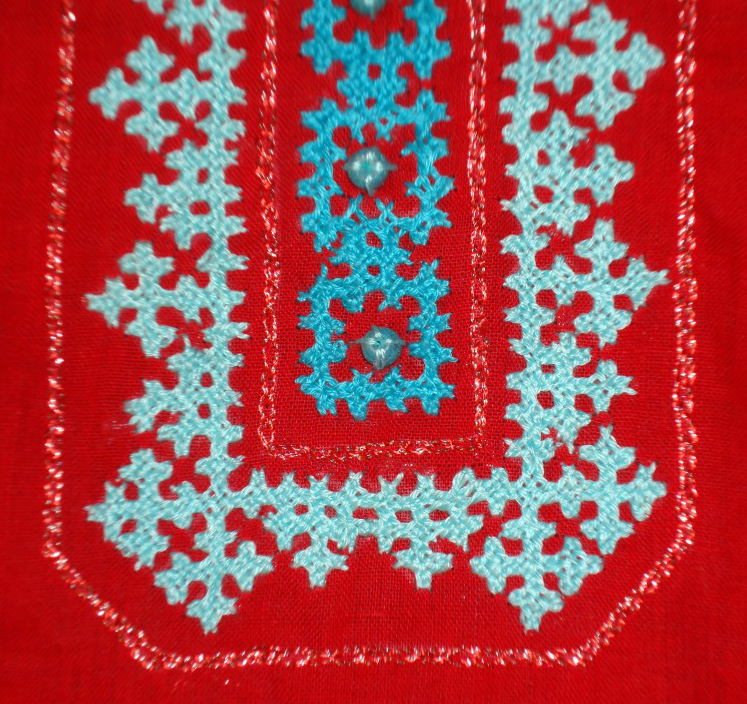 The border outline stitches around the centre were worked in lighter blue. After working the interlacing stitch. The detail of the embroidery. 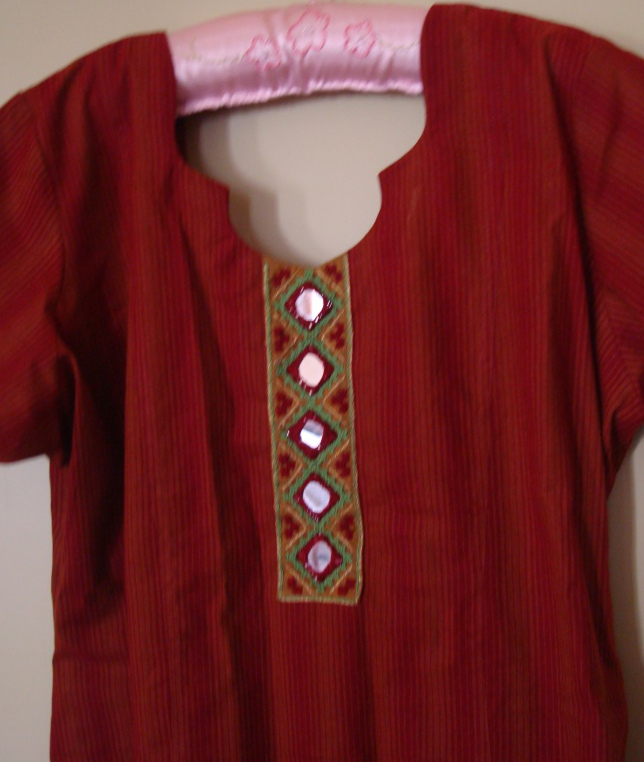 The sewn tunic with red yoke. 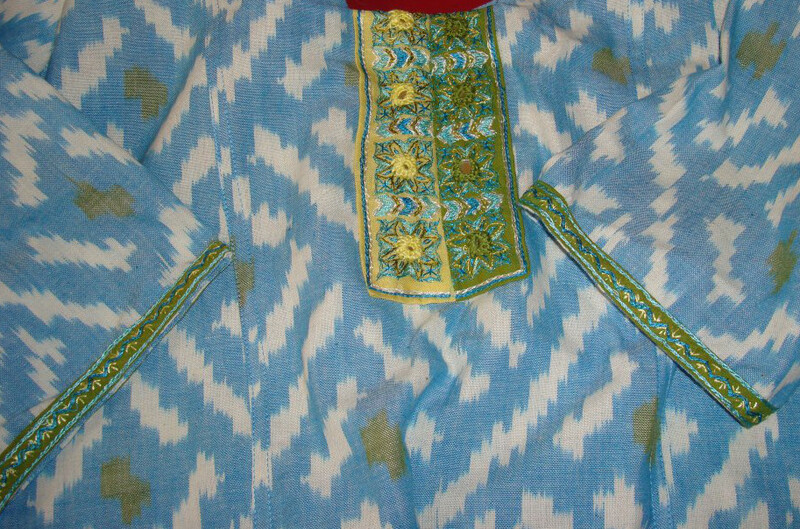 A Patiala salwar in same shade of blue was bought to match with this tunic. 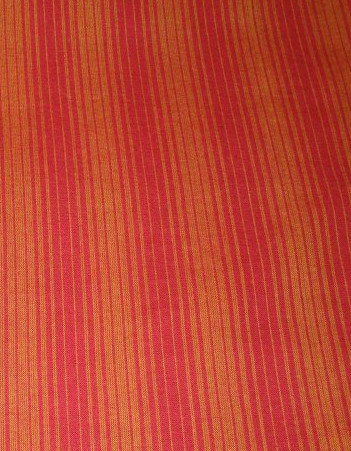 The tunic fabric is mangalagiri cotton with maroon and yellow stripes. I came across a geometric border on a tunic in a shop. This was a printed border. 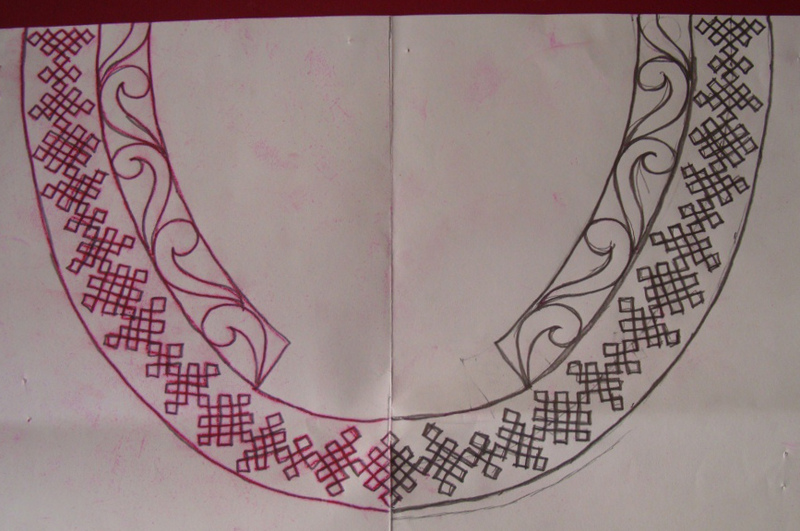 I wanted use this design idea for embroidery on tunic. 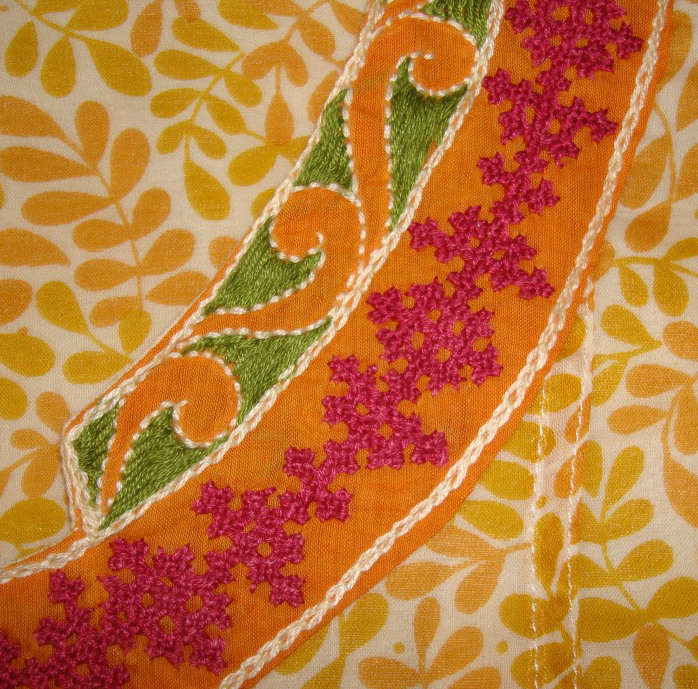 This inspired pattern had both mirror and kutch work elements. Starting with metallic thread and small kutch elements. Chain stitch outline in green thread. 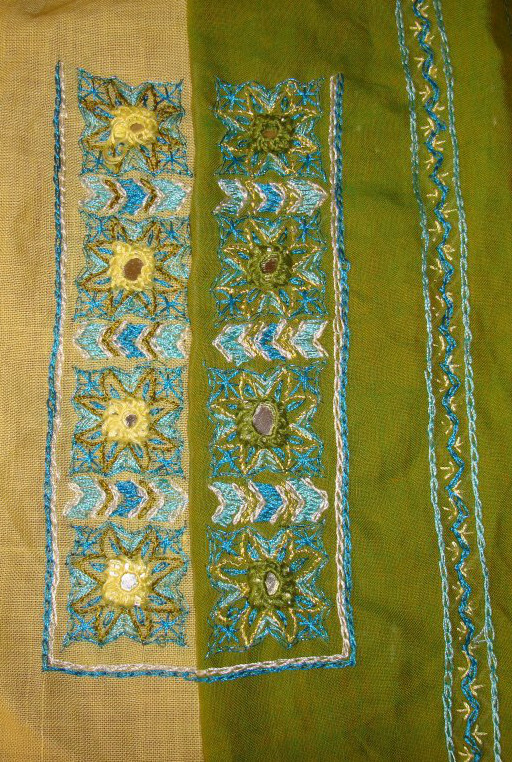 The same green thread is used for continuous kutchwork design. Medium square mirrors were stitched on this embroidered border. It was hard to take a straight picture of this tunic, because of the mirrors. 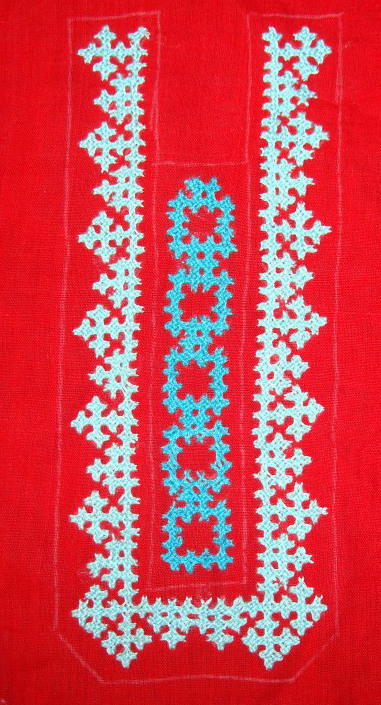 The detail of the sewn tunic with embroidery. 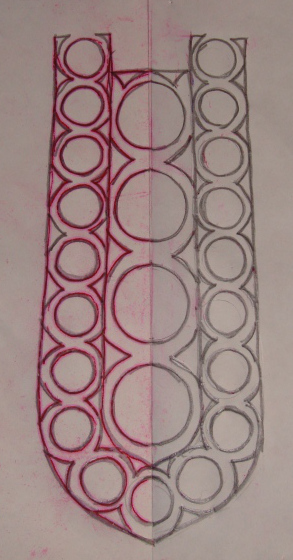 This being a geometric design, it also was an inspiration for this black work border. I have not used this pattern. 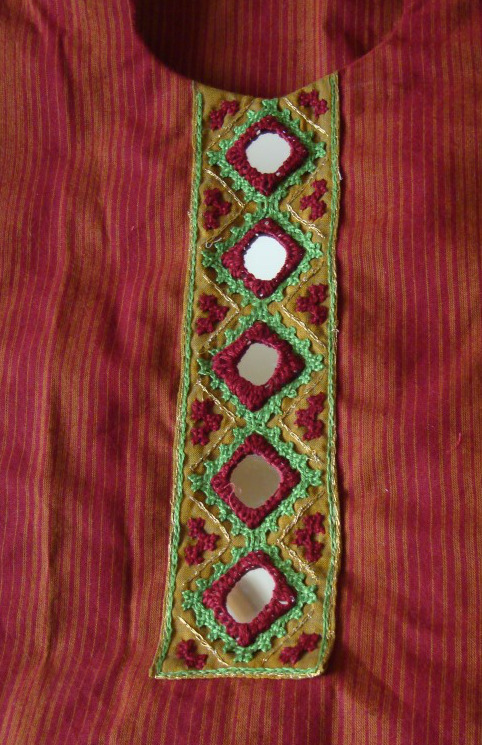 Sometime ago, I had this idea of working the same pattern on two fabrics and combine them to use as tunic embellishment. 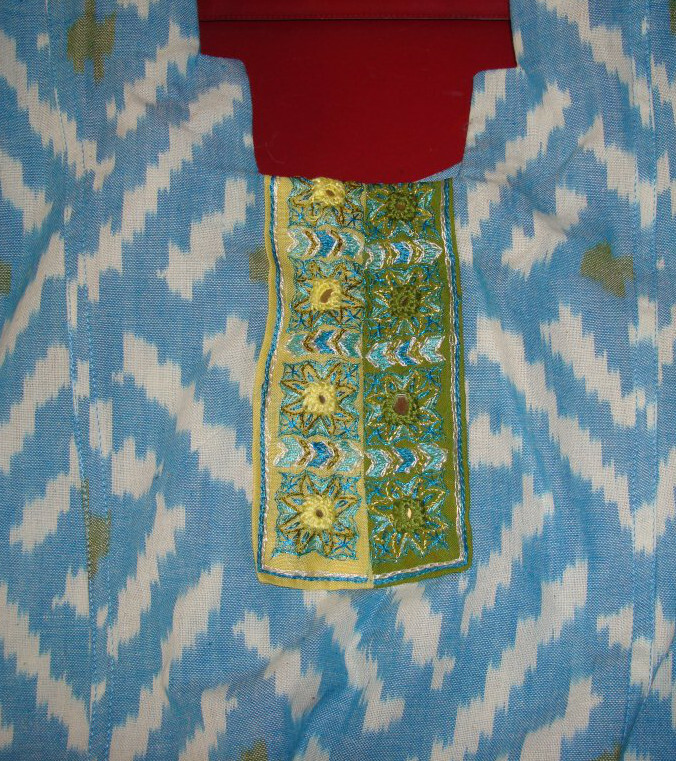 The tunic chosen for this purpose was an ikat cotton fabric. The pattern was simple with mirror work, that which can be worked with Aari needle too. I worked with the normal # 9 crewel needle. The pattern for the yoke and the sleeves. The patterns were traced on these two fabrics. 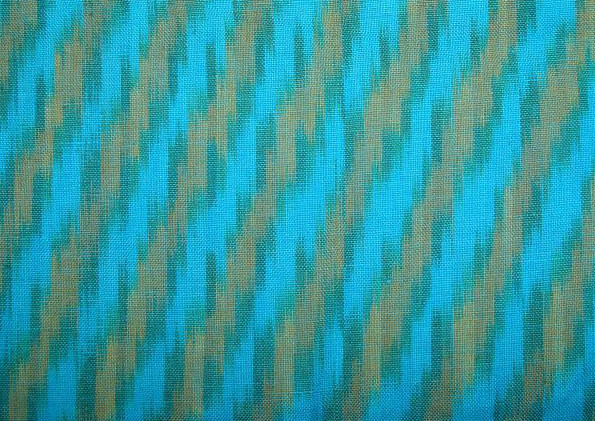 The sleeve pattern traced on green fabric. The pieces after working the embroidery and mirrors. The two fabrics sewn on tunic. The tunic with sleeves. The embroidery was quite simple on the sleeve border. This yoke which was done in 2013 was inspired by ready made mirror work borders available in the Indian market. These borders are actually made with round sequins or discs called mica. The embroidery on them is done with fine silk threads and beads. They are attached to sarees, tunics in India. This yoke is worked with mirrors. 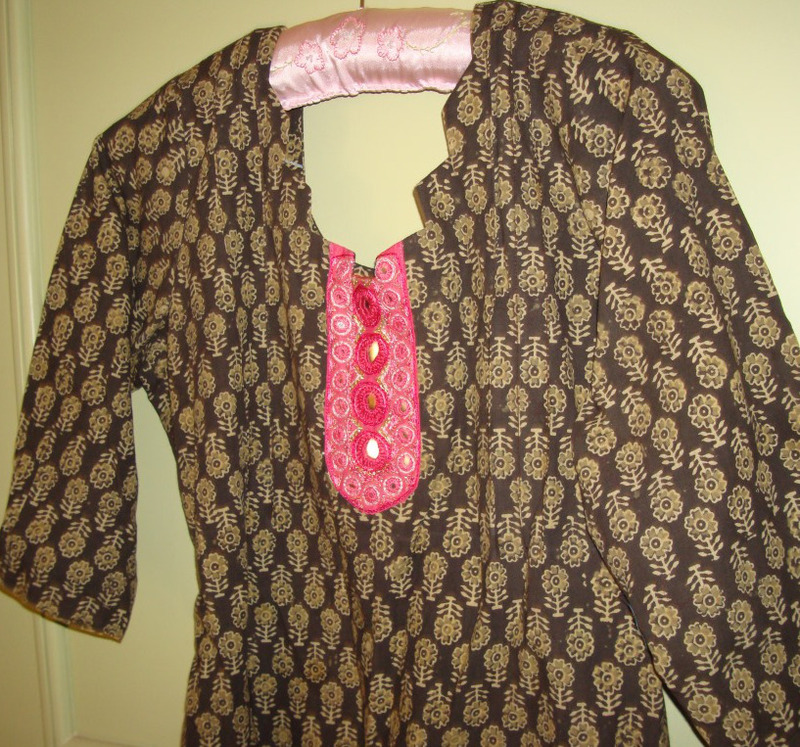 The tunic fabric is block printed, vegetable dyed, handloom cotton in black. The embroidery other than mirror work is done with silk threads, the pink thread for herringbone filling on triangles and golden colour silk thread for chain stitch. Gold metallic thread is used for outlines in chain stitch. 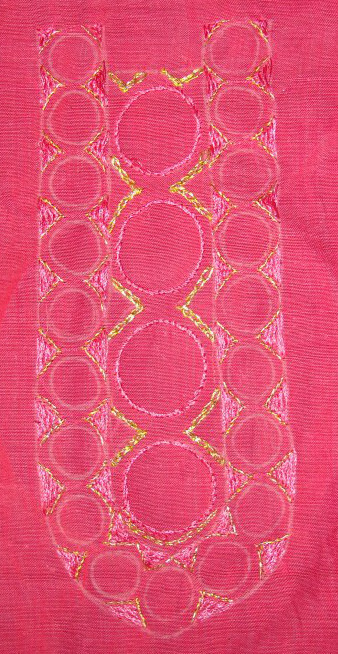 The inner mirror outlines are done with pink silk thread. The small mirrors are outlined in chain stitch with white thread. The detail of the inner outline made with golden thread. 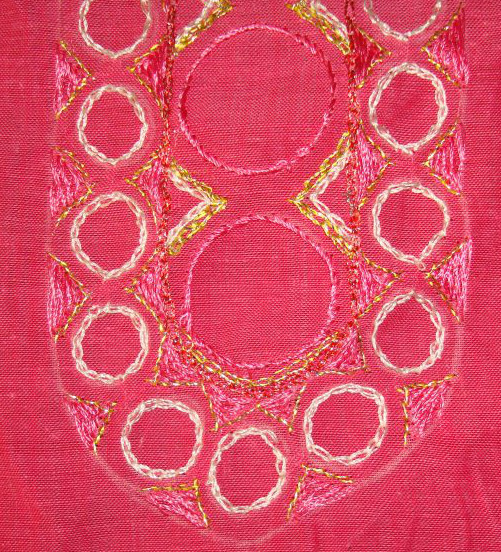 Another outline around the central mirrors made with medium pink thread. 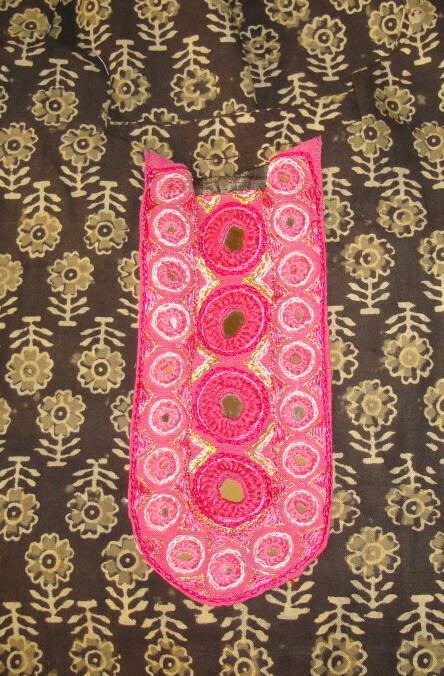 The inner mirrors are fixed with shisha stitch. The final step was to work the small mirrors with shisha stitch. The pattern for this mirror work yoke. I match this tunic with black trousers. The handloom fabrics feel cool in summer season. 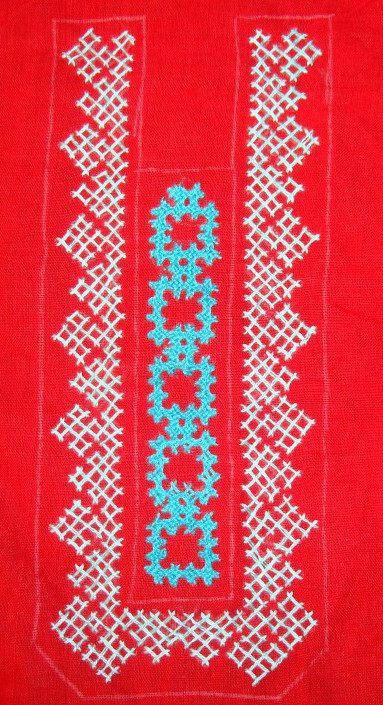 A sample of the border available in the markets. 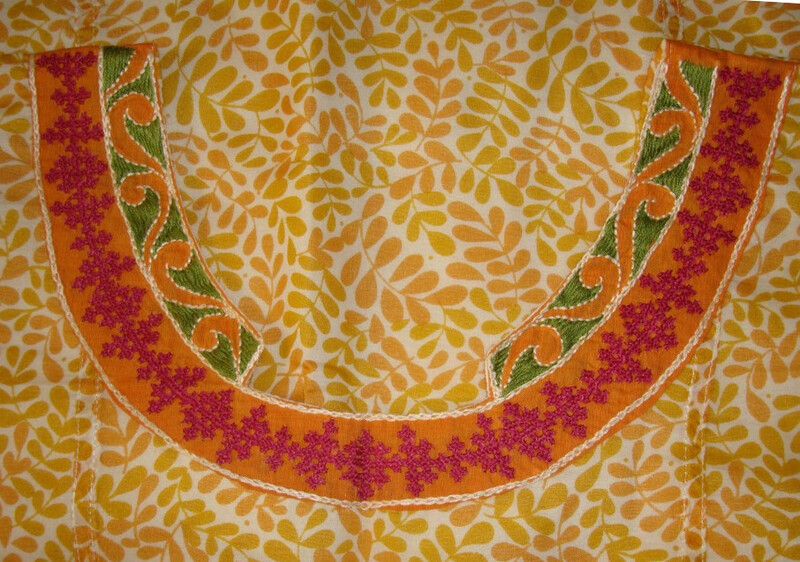 This embroidery around the neck of this cream and yellow printed cotton tunic was done in the fourth quarter of the year 2013. This type of tunic with simple embroidery is always in fashion. 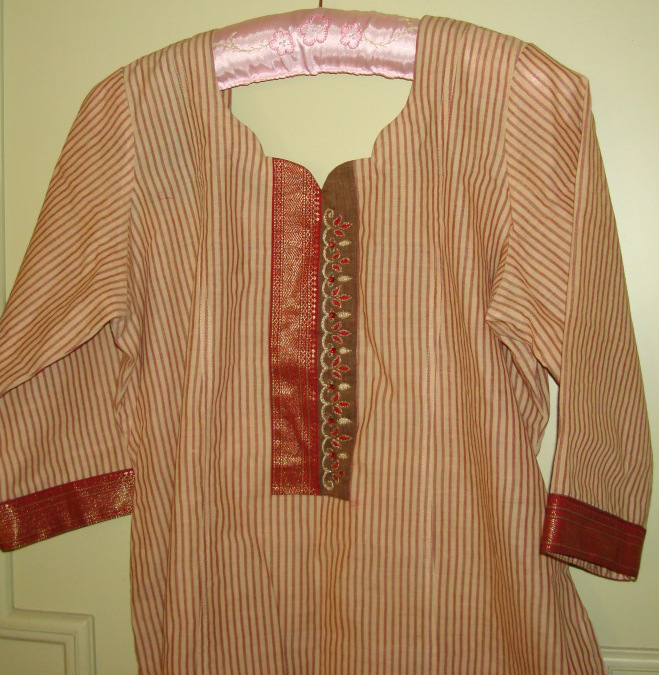 The tunic fabric is handloom cotton. 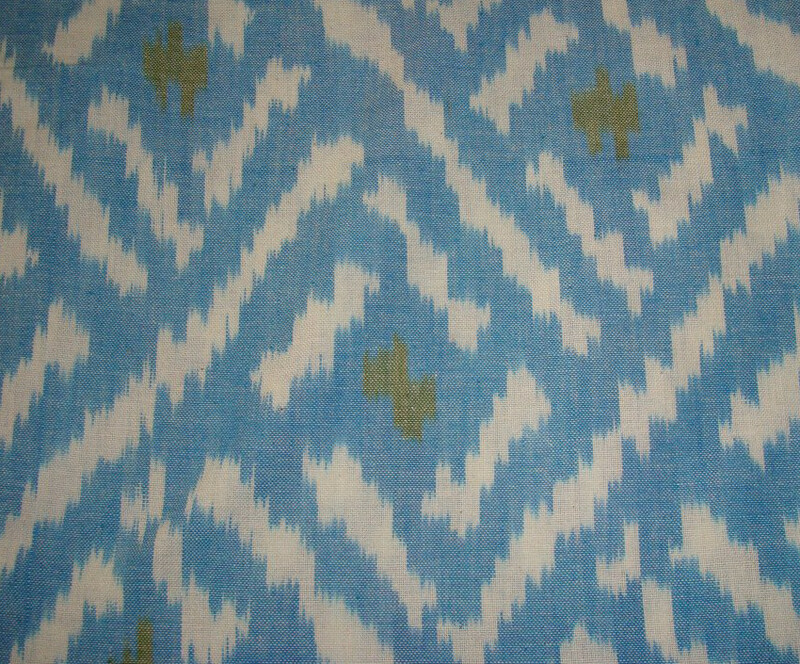 I had another handloom [mangalagiri] cotton fabric with zari border. The pattern was drawn on that. The embroidery was worked with cotton skeins, metallic thread and stones were added as embellishments. 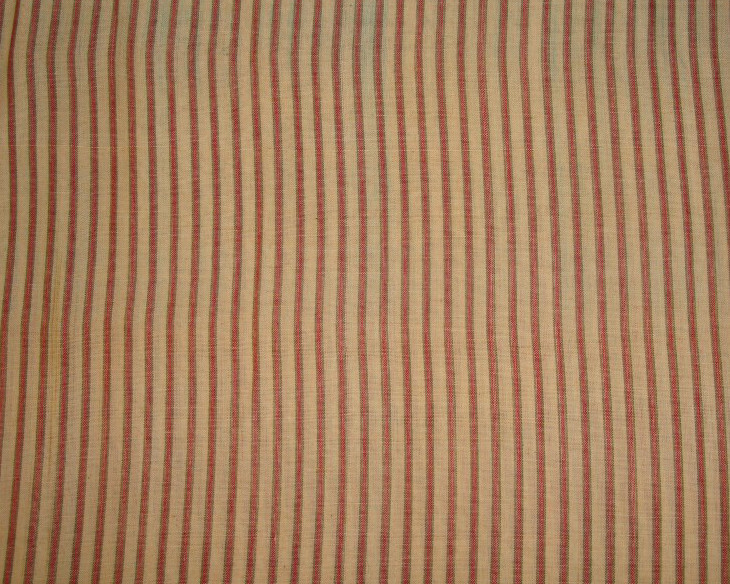 Herringbone filling stitch was done in red thread. The same stitch was used with the beige thread too. The outline was done with gold metallic thread, worked like this it looks like Aari work. This I have to learn one day. The last part of this piece was completed with stones. The tailor did a good job of sewing this tunic, again I love the neck line. The extra zari borders were sewn on the sleeves. The pattern for this embroidery. This tunic is worn with maroon jeggings. The fabric feels very cool in summer. I feel the zari border played a big part in this tunic project.